Home » Do Higher Res Dailies Save Money? Do Higher Res Dailies Save Money? Senior Colorist Mike Smollin, shown in Mega Playground’s Nucoda suite, sets up his monitor for a DP Dailies session. West Village-based Mega Playground claims its higher resolution DP Dailies scanning process–they’re done at 2K–not only cost less than standard issue HD telecine transfers, but foster creative control, diminish frustration between DPs and editors, and potentially save money. Pretty tall order for a transfer, but let’s have a look. Dailies, of course, play a crucial role in production, yielding both performance and technical cues. If you shoot in HD, there’s a practical reason to project dailies too, since it’s easier to check focus, which is not always the case when using monitors on location. Prior to video’s take over of post, feature productions, of course, didn’t worry about adequate resolution from their dailies, since screening those via one-light 35mm prints had been standard procedure for decades. But whether you’re posting video or film-originated work, HD dailies have been commonly use for screenings for a number of years now. For its DP Dailies rollout earlier this year, Mega Playground touted a number of advantages, among them what seems a rather minor bump up to 2K res from standard HD transfers of 1920 x 1080. How can that matter? First, let’s take a few steps back and consider what a director, DP, or editor is seeing when viewing a film daily on HD via a straight transfer; it’s a view through a (real) video window aimed at replicating the ultimate goal: that final film print projected in a theater. Problem is, just like the color changes inherent when printing out RGB images from Photoshop into the CMYK world of print, the HD video world doesn’t directly relate to the photochemical realities of film. While experience will allow those involved to know the difference between projected HD versus film, common habits of perception gives a different twist. After weeks and months editing and making aesthetic judgments from a standard issue telecine transfer, it’s that which becomes the new standard, not what’s in the can. “I’ve spent a lot of my career working to create a system where you can produce dailies that will be exactly what your final film print will look like, or as close to it as feasible,” says Terry Brown, Chief Technology Officer at Mega Playground. Brown worked on developing what would become DP Dailies while at Technicolor’s LA division. He sees the process as a natural next move for high-end post. “Since most films finish as DI’s these days, this eliminates the disconnect between the DP’s original vision as seen in dailies and the DI end product,” says Brown. Using DPX (Digital Picture Exchange) is key. 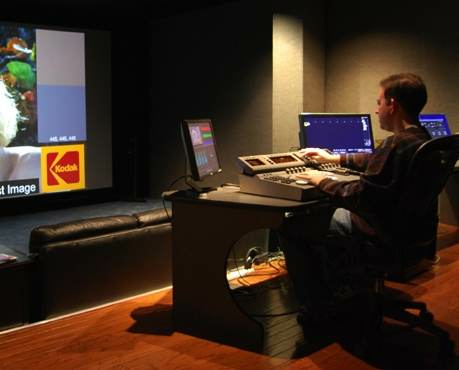 Originally developed by Kodak, over the years it’s become the most commonly used format throughout visual effects creation and digital intermediate post since it saves original camera negative color info in a 10-bit uncompressed log format that integrates closely with the photochemical print process. By keeping data output from high-end film scanners in this resource-hungry yet robust format, users gain a lot of flexibility in storing color and other information for use throughout the post process. It’s also the most accepted standard for trouble-free file exchange among post facilities. DP Dailies itself uses concepts and software technology–named Bones Dailies–originally developed by Grass Valley and Technicolor (both part of France’s Thomson), and now owned by Germany-based DFT Digital Film Technology. The process sought to create a single workflow from original camera negative through DI and final graded color master. Brown, Project Manager of Bones Dailies during his time at Technicolor, sees DP Dailies as the fully worked out vision of that project, since it offers one crucial advantage–digital emulation of the final photochemical print–from beginning to end of a project. That hasn’t been available until now, although competitors including Technicolor have their own version of the process. Mega Playground employs Linux-based Bones software and database to take its gear to a higher level, networking together a Spirit 2K telecine, Nucoda’s HD Grading System, and a SAN from Digital Video Systems to handle the massive storage needs. Hardware from UK-based FilmLight does the hands-on color management. Bones maintains all metadata–including Keycode information–in its internal database. The software employs templates that enable you to more easily integrate your particular mix of gear. For example, you can set up automated procedures to speed formally manual operations. This includes the slick syncing process, which uses algorithms that analyze each file, identifying camera roll Sticks/Slate closures. Location audio, which imports faster than real-time, is synched with frame accuracy; the standard telecine setup only syncs to the accuracy of TC frame base. While you might think the push for higher res dailies is designed to simply wring more money from a production, that’s not the case, according to Mega Playground owner/co-founder Eitan Hakami; he claims the highly integrated process will save post charges since it is “substantially more efficient” than the standard piecemeal approach which begins with telecine working in HD’s video space. Part of the savings comes from archiving raw scans from the Spirit as the source for the final DI. “You’re essentially starting your DI process at the dailies stage,” says Hakami. Scanning once saves on time and labor charges while minimizing the handling of precious film negative. Since any color correcting done at the dailies stage isn’t lost, he also argues that DI conform and final color correction are pushed forward, and begin at the very first stages of post. “We can easily demonstrate how this process can save producers (who shoot over 200,000 ft. of 35mm film) a minimum of $100,000,” says Hakami. Not a bad position to take when your main competition, Technicolor New York, is literally around the corner.